Please welcome Edward Stephens and YB 0771 to Ys on Parade. We have four new Collectibles for you on the Collectibles page. Another stunningly beautiful UK Spring Run completed, thank you Jerry and the crew for a lovely day, if a bit drippy! Once more beautiful Cotswold villages you normally would not have found and super scenery! Well done. For those of you who missed out, there is always next year, and there is also the Yorkshire weekend coming up too. See the Events page for details. More information on the MG YS has come to light - please click here for an update. Well, two years in, and thank you all for your support and enthusiasm. Your committee remains totally committed to your safe enjoyment of both your Y, and your website. This month's mid-month Reprinted Article comes from one of the newest Y owners, Scott Barrow, so thank you Scott. Please enjoY his contribution from The Motor Magazine, November 1947 - a totally new magazine article I had not previously seen. Only a few days to go now until the UK Y Register Spring Run. If you have not already registered, but would like to come, please contact Jerry Birkbeck for a late entry. His details can be located on the flyer downlaodable from the Events Page. I discovered yesterday where some emails had disappeared to which had been sent in during early March, so apologies if you sent something in and had it returned to you with a message saying the Mail box was full - it isn't now! After having a break Richard Prior has taken up the pen again to entertain us with more ramblings from the Antipodean Adventure! As we move into Europe with the team I have started a new page so your downloads of Part 2 should be quicker. A new book has been added to the Book Review page too, it is by Andres Ditlev Clausager and is another good "coffee table" book. Please welcome Dave Rowland and YB 0649 to Ys on Parade. Hopefully Dave you will make the Spring Run - just up the road? Hope so. Dave's car also marks another milestone for Ys on Parade, with 100 cars from the UK alone! EnjoY! The Links page has been updated for a new link - courtesy of the UK TV Channel 4 website indeed. Follow all the links for a fantastic MG write up with a very good bit on the Y! Amazing, and really good that our car is getting the attention it deserves after so many years. I am sure a few years ago we would not have featured! March was a busy month for me, so I was pleased that I did not have too much updating to do. I am settling in OK but there are things to report. If you have received your copy of Safety Fast for this month and read the Y Register notes you will already be aware of the recent find that Neil Cairns and I have been working on. Some time ago Neil and I heard of a very unusual &apos;Y&apos; type. We are all familiar with the YA, YB and YT, but not the &apos;YS&apos;. A few lucky people have seen the very rare &apos;open top specials&apos; built by Reinbolt & Christe of Basle in Switzerland. These were unofficially called YRC models. Only one YZ is known of, a special bodied coupe YA by Zagato. (These can all be seen in John Lawson&apos;s book.) The model Neil and I had traced was built by MG. With the demise of the pre-war SA/WA a gap arose for a new six cylinder MG saloon within the post-war range. The company went as far as to built a one-off special as a feasibility study, and we have now managed to unearth a rather poor black & white photograph from the archives. The only modification the car had was an extra five inches let into the chassis just aft of the front cross-member, only the bonnet required lengthening. This meant that the steering wheel was a little more upright. The engine block is a XPAG with two extra cylinders, a one off casting. 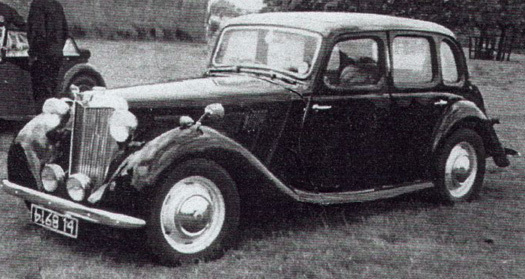 It used a six-cylinder crank-shaft from the pre-war Wolseley Hornet suitably adapted. Power output was not very high, as the single SU carburettor fitted limited power to about 65-70bhp, but the torque was excellent. The whole idea was not just for a bigger &apos;Y&apos; but that the ohv six engine would complement the industrial &apos;Brockhouse&apos; range and marine &apos;Navigator&apos; that Morris offered for boats. Currently Morris could only offer side-valve engines in this area. At just five inches longer than the standard XPAG engine at 1875cc., the &apos;YS&apos; (for Six-cylinder Y) would have been a nice car. But by then the models body styling was very dated, and the photo shows the slightly longer bonnet required for the engine. The run away success of the TD really killed the model. MG just did not have the space or resources to build another model, the little Abingdon factory was bursting at the seams with TDs. One wonders what happened to that prototype. We will continue to look into the matter. More anon. Moving swiftly on to events, this moth we have the Spring Run. There is still time to register for entry with Jerry - but be quick. This is the UK season opener and always an excellent opportunity to get the car out and running again and meet old friends after the break. Also, the MG Octagon Car Club have released details of their 18th Wings Run - see the Events page for more details. Also do not forget the Ys for Yorkshire Run in August 13 - 16 - also on the Events page. I wish I was back in the UK! If you have an event for Ys, let me know and I'll post it on the website for you. And then there is the new Picture of the Month too!